Son came home yesterday to announce that he flunked three subjects. Seeing how he worked for it, I am not surprised with this result. Naturally, I am disappointed because he is capable of much better results but he is just not motivated to work for it. Till yesterday, he is still clueless what he wanted in life or what is his inspiration. Was it that I was engrossed dealing with his ADHD that I overlooked to teach him inspiration and dreams? Today, his VP talked to him and he told me that he is actually worried that he might not be able to get promoted. As his mom, I suddenly felt a tinge of joy that he realised by now that not every time is play time. There are moments in life that you got to be dead serious. Now I can only surrender son totally to HIM and pray that all will be well and a chance for son to show his potential. He is already asking for tuition and I am really surprised. Today will be the last home bound day for my girl. I am glad that she took it quite positively despite all the extra tuitions and revision that she done. At least, she has tried her best effort and that is the most important. Whatever results that she attained no longer matters to us. Having said that, I wished that the school will hold the exam earlier than later, it is hard to have the big one playing and the small one having to study but I am glad that my little one did try her best to hold her attention. When exam spread out into 3 weeks, it is really tough. She seems to be studying all the time. Lucky for me, this little one is really easy to motivate and sensible for her age. She is able to sit all by herself to do her revision without me worrying whether she is focusing or playing. I am truly blessed that I have a balance between these two kids. The weather has been awesome as well. Though wet but not terribly humid. These 4 days, girl and I enjoyed each other's company tremendously. I will rope her in our meal preparation and baking during her study break so that she can de-stress and I think she enjoyed it for last night, girl requested that we made breakfast together this morning. I took out a mochi pancake recipe that I have been keeping and waiting for opportunity to make. We sure had fun making these. Instead of making them in a pan, we turned them into balls in my Ebleskiver pan that VA's hubby gave me during his trip here. Now we are off to some shopping before yet another tuition. I am praying hard that he will mature in time for his “O” level next year. Whisk together the flours, granulated sugar, baking powder, allspice, and salt in a large bowl. Separate the egg whites into a medium-size bowl, and the yolks into a small bowl. Whisk the egg yolks with the milk, oil, and orange zest. Stir the milk mixture into the the flour mixture until just combined. Add the rest of the egg whites and gently fold them in until no white streaks remain, taking care not to deflate the batter too much. Use the batter right away. Preheat a pan medium heat and add in a little butter or oil. Using an ice cream scoop, scoop the batter into the greased pan and let it cook. Flip over the ball and continue cooking till the dough is done and golden. Serve with chocolate sauce or maple syrup. 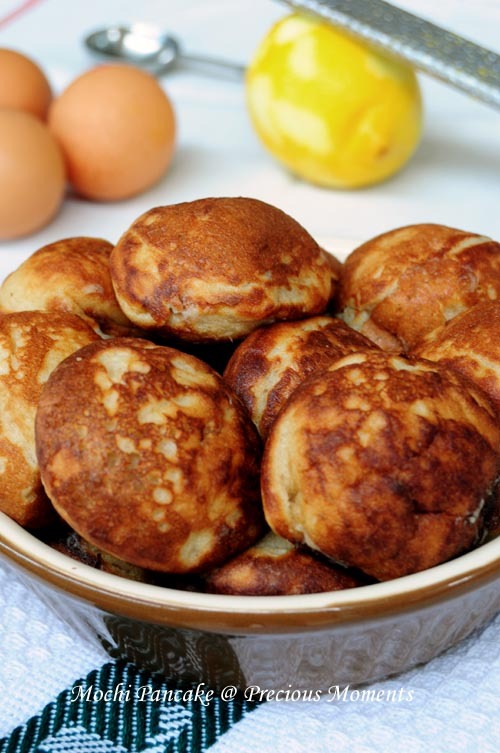 Time to take out your Ebleskiver pan! Edith, reading the lines i can see your worries about your boy. lets surrender him to God and only Him know how to deal with it as He is the one path the way. the girl is so sweet, hope she can cheer up your day. Thanks Ah Tze. I just pray that he will see light before it is too late. PH, Let's pray he will bloom in time. I've always been following your blog and know your worries about your boy. I think you should ask him what he really wants to be and from life. Then from there maybe the two of you can work it out. Eg. if his interest lies in soccer then encourage him to pursue his career from there. I think this is the best win-win solution to your worries but let him know that at least he have to completed his Form 5. Delia, the issue is that he still doesn't know what he wants and he is not accepting guidance. So we ended up nowhere. Guess you just have to take it easy. I've been thru all these & it's a stage that we've to go thru. I'm glad you've found your way out destressing by making food together with your gal. Here's one fun recipe you may like: Lovable Teddy Bear Sandwich Recipe!